Exactly 4 months ago I deposited money at Saving Stream and started lending. Saving Stream is a UK p2p lending marketplace operated by Lendy Ltd. that facilitates bridging loans, that is short-term loans for typically less than a year, secured by commercial property. Investors can see valuation documents for each listed loan. 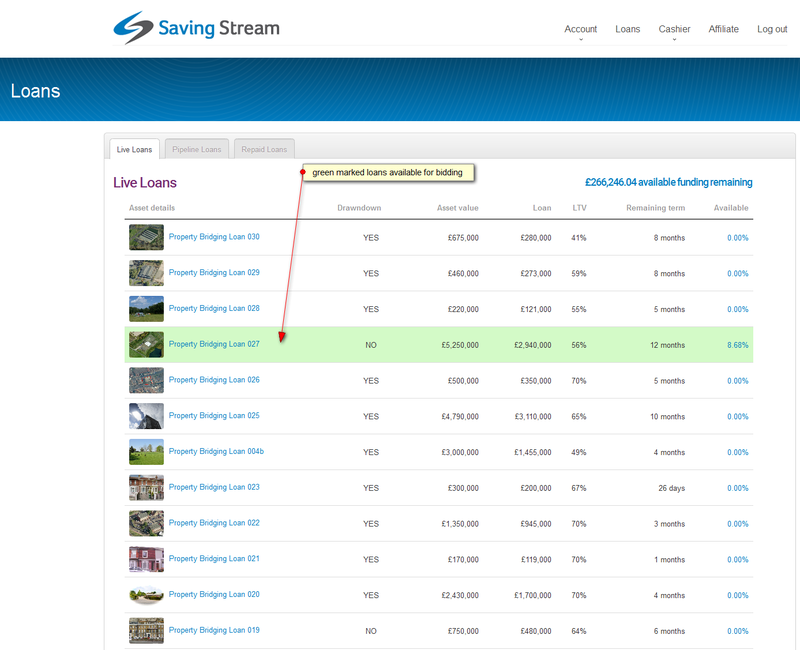 Saving Stream operates since January 2013 and with 25 million GBP loan volume originated since launch it is one of the mid-sized p2p lending sites in the UK. Saving Stream is open to international investors; you don’t have to be a UK resident. Investors are paid 12% interest, accumulating starting at the day they bid on a loan. The interest is paid monthly (starting with drawdown); the principal amount is repaid at the end of the loan term. Saving Stream does not charge investors any fees. Since I don’t have a UK bank account I used Transferwise when depositing money in order to save on bank fees. For larger amounts (approx. >1,000 EUR) it might be even more efficient to use Currencyfair so check that too. Some of the smaller loans (e.g. 200,000 GBP) fill within hours of coming onto the marketplace. I do like that I can deposit money (Cashier>Deposit>Step 1) and bid with this money without having to actually wait for the money to arrive (which usually took 1-3 days with Transferwise). 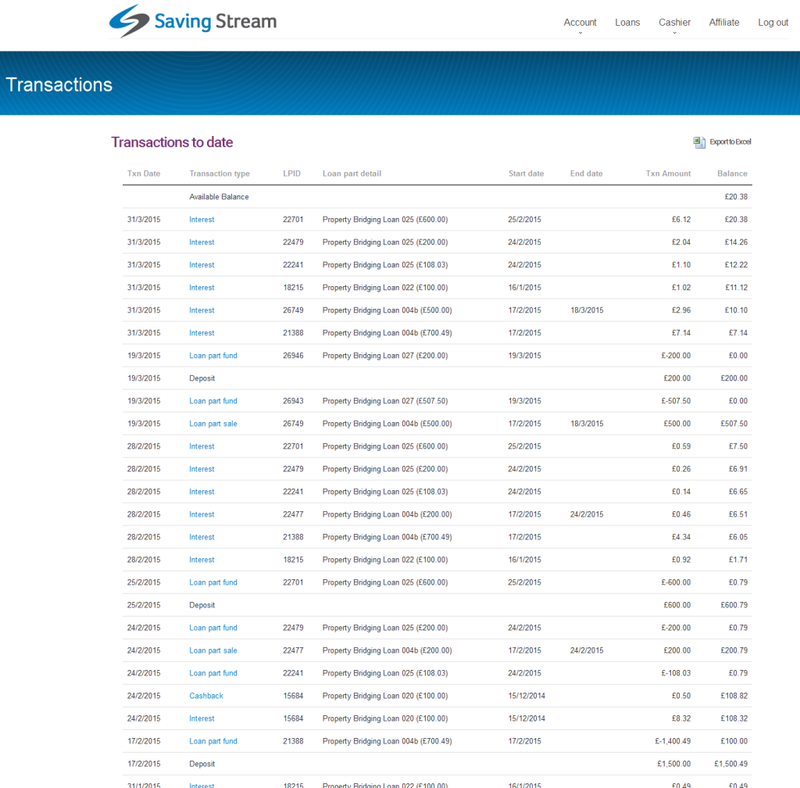 The Saving Stream p2p lending marketplace is very simplistic and easy to handle. There is a view of the live loans. Only the green ones have amounts open for bidding. The secondary market does not have a seperate view but is integrated into the live loans view. There are no fees and markups/discounts when buying and selling on the secondary market. So when a loan part is listed for sale, the amount is just added to the available amount for this loan. I have invested about 2,500 GBP, which is currently spread over 5 different loans. What I usually do is that when I deposit money I put all of this money into an open loan (usually there is only one), in order for the money to start earning interest immediately. Later when a new loan comes online, I sell some of the older loan parts (they usually sold within minutes) on the secondary market to reduce my position in this older loan and invest this amount into the new available loan. Many investors seem to be doing the same, as it is a typical pattern for older loan parts to come on sale just as a new loan is listed. But actually diversification in my view is not as important as on other platforms – but still important. This is due to the fact that investors are actually lending to Lendy Ltd, rather than the individual borrower. So the main risk is that should something happen to Lendy Ltd. investors are affected, no matter which loan they invested in. Saving Stream has a provision fund, which has a minimum of 2% of the live loan book. View into my transaction history. Right after taking the screenshot I invested the 20.38 GBP into loan PBL027 so my cash balance now is zero.